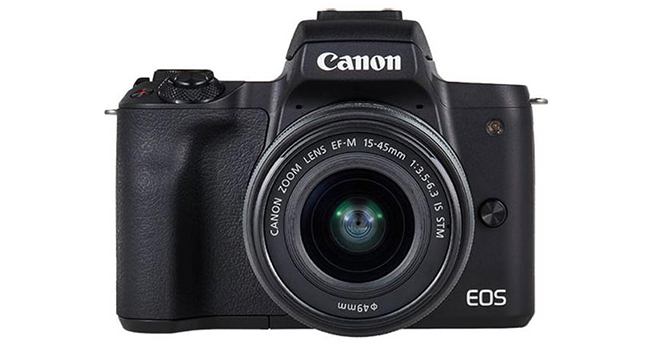 The Canon EOS M50 is an entry-level mirrorless interchangeable lens camera aimed at those who want a lightweight solution backed by great images and video, without the extra weight of its more expensive siblings. It benefits from a fully rotating touchscreen, electronic viewfinder and a 24MP APS-C sensor as per the M-series. This end of the market likes to cram in the features and the M50 is no different. In many ways, it’s for those who are dipping their toe into the market for the first time. Video is an important factor with this market’s consumer, with the M50 delivering 4K/24p UHD video but with a 1.7x crop. Dual Pixel AF can be used in all video modes apart from 4K, but you do benefit from 99 selectable focus points. The M50 is also the first Canon to use the new CR3 Raw format and C-Raw standing for compressed full resolution. The M50 is an entry-level mirrorless but, although being compact, it has the feel of a more expensive camera. It integrates the Main body design of the M100, having one control dial, but with the addition of a grip and hot shoe. 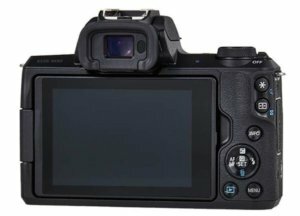 Take away the hot shoe and it’s more or less the same size as the EOS M100. Easily accessible video record buttons, on/off switch and the mode dial immediately make the M50 feel like a higher end offering. AE lock and AF frame selection buttons are located on the back of the camera and easily located. The touch LCD can be fully articulated which makes it a breeze to use in addition to being one of the best screens available. Having full articulation means you can get the perfect shot from any angle, a feature which really should be on every camera. M50 also includes a micro USB port and battery compartment which holds an LP-E12 battery, the same as the M100. The battery life isn’t amazing at only 235 shots per charge, but there is at least an ‘Eco mode’ upping the shots per charge to 370. The body is compact enough to fit into an average size hand and although it may not be as portable or compact as the M100, it’s still small enough to pack a punch at this price point. Remember, the M50 is at the ‘budget’ end of the market, it’s fairly simple without over complication, so don’t expect ultra in-depth feature sets here. A variety of image formats are desirable when you move to an interchangeable lens camera. The M50 supports the next-generation CR3 RAW format and the new C-RAW compression format. Dual Sensing IS, Canon’s image stabilization system, uses internal gyroscopes and the CMOS sensor to detect motion, equating to a half stop reduced shake. The M50 is the first Canon to have Eye AF with Face Detect + Track mode, but at this stage, it’s still quite limited compared to the competition. AF is quite rapid on this little guy with the ability to focus on moving objects very well, just as long as it’s not pushed to the extreme ends of ISO. The abilities to use Wi-Fi, pair with an Android device, and link via Bluetooth are great features. Bluetooth allows constant connection between the M50 and a smartphone and being able to send JPEG images automatically to your phone and computer is a great asset. Surely Canon will include this feature in future models. The M50 has small size on its side and, although it only has one control dial, you can see this as keeping things simple for the entry-level consumer. One of the biggest standouts is the integration of 4K video, however, it is on a 1.7x crop and doesn’t use Dual Pixel AF. This was only a feature up until recently on the highest end of cameras, so at least the quality level is here, even if it isn’t as usable at this stage. The addition of 4K video is great, but having Dual Pixel AF system disabled, the limited crop factor and rolling shutter mean it’s limited at best. However, 1080p video works far better. The takeaway here is to use other settings than 4K unless it’s on a tripod with a static subject. Being able to connect to your smartphone and have instant sharing is a great bonus on this camera. We are all used to shooting a bit of video on a smartphone and having it instantly available online, so having the ability to quickly send images to your smartphone and then transfer them by email or post to social media is something we are accustomed to on our phones, so it makes sense on all levels of camera. You can use a variety of lenses on the M50, like the 11-22mm f/4-5.6 but as compact is key here, it’s worth bearing in mind the lens choice. The M50 has the usual vibrant colors Canon is known for and can be equally versatile with street photography, landscapes, family and lifestyle, travel, and video. That said, a problem with the 4K video feature is that wide-angle shots are nearly impossible and the quality isn’t as great as you would think it would be at this level. But for general use for videos and stills, it does play great. If you’re considering something like weddings, action, portraits, sports or wildlife images, you may want to opt. for a model or two upwards. Full auto mode is handy for any beginner, so having things like an Auto ISO system is very beneficial. It’s only a basic version on the M50, not as versatile as on higher Canon models, but the feature is workable. The new Digic 8 processor coupled with the APS-C 24 megapixel sensor gives overall images along the lines of the M100, but as any entry-level digital camera, it operates best at the less than extreme ranges. In the majority of cases, the M50 produces some nice sharp and vivid images. The ability to shoot 4K combined with the M50’s fully articulating LCD and compact size will make it an extremely useful camera. If you ignore the shortcomings of the 4K capability, it’s a great entry-level compact interchangeable lens camera and a wonderful choice for aspiring photographers and vloggers.